Hope is the thing that I hold onto. As long as I can remember, I remember hoping. I was a child and I remember hoping my dad’s car would start. I remember when my mom was dying of cancer, hoping she would be cured despite the fact she had an incurable form of cancer. Hope is what helped me through those 2 years as my mom struggled for life. Hope is what carries me now, 24 years later with other trials I face in life. Hope carries me. Serendipitously, the book, Making Hope Happen entered my life. It is a book I read over and over, because I have come to realize the power of hope and when I look at people around me, at home, in school, I notice there are people who are hopeful and there are people who are not. I think the reason I go back to this book so often is because of Dr. Shane Lopez’s message that hope can be shared with others. Hope can be shared with others. Hope does not mean that the thing you hope for has to happen, it just gets you through to where you need to go. I struggle when I am with someone who does not have hope. In intrigues me as I wonder why I can be hopeful, even in the darkest times and others have no hope even in not so dark times. When I see children in school and I recognize that they do not have hope I struggle to figure out a way to give them hope. In the world they are growing up in, they need hope more than ever before. As an educator, I have to ask myself, “How can I teach hope to these children?” Inspired by Dr. Shane Lopez’s Ted Talk, and book, “Making Hope Happen: Create the Future you Want for Yourself and Others” the #G2Great team decided to take Dr. Shane Lopez’s advice and create ripples of hope for students everywhere through our #G2Great chat on Thursday, May 10, 2018. Until I wrote that I date I did not realize it was also my mother’s birthday, Happy Birthday Mommy, this is perhaps the best gift you could ever receive. 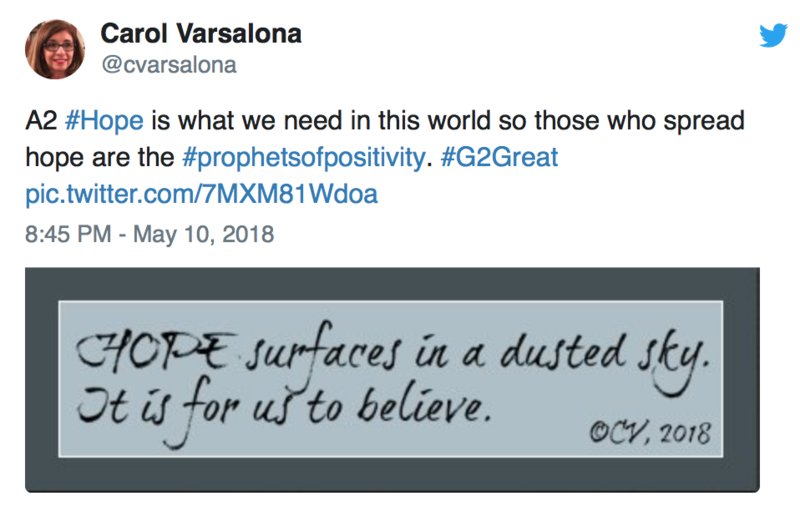 I know when #G2Great trended that night and when this blog post is published (late because I drafted and revised too many times) I know the ripples of hope are alive and in motion spreading those who need hope to continue their journey. Hope carries us through life. The power in hope spreading across our schools can be seen through the tweets from our #G2Great PLN. This post is dedicated to the memory of Dr. Shane Lopez and my mother, Jane M. Kruger – both who always inspired hope. Special thanks to Dan Sinnott who shared Shane’s work with me through one email on 7/28/2016 and spread more ripples of hope. Forever grateful.